If you have cracked, broken, decayed, or even missing teeth, dental crowns and bridges can be used to effectively fix them and make sure your beautiful smile feels as good as it looks. A dental crown is a tooth-shaped restoration that fits over the top of a damaged tooth, and it can be used to do everything from improve a tooth’s appearance to restore its lost structure and strength. They can be made of a number of materials, but for the most natural-looking results, we recommend those made of porcelain. They typically take about one to two visits to get, and in the end, they’ll completely blend into your smile. 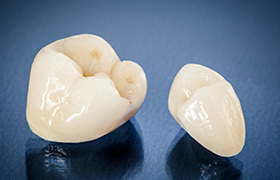 Crowns are so versatile that they can actually be used to replace missing teeth as well by forming a dental bridge. Bridges can restore a single tooth or even a row of consecutive missing teeth. 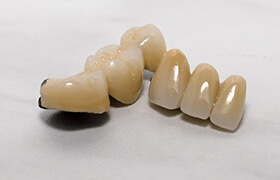 They consist of two dental crowns placed on top of the teeth surrounding the gap in the smile, and these are then bonded to prosthetic teeth that literally “bridge” the space between them. Not only do they help a smile regain its appearance, but they can also prevent many issue that can be caused by missing teeth, so as jaw alignment issues due to the remaining teeth shifting into the open space. If your smile needs a little help, dental crowns and bridges are likely the answer. Is either one right for you? To find out, simply give our office a call to schedule an appointment.